There is a love story at the heart of this this programme. Kaprálová was one of the most prodigiously gifted composers and conductors of her generation. Martinů, her teacher and mentor, was the leading Czech composer of his time. In the turbulent years running up to the outbreak of World War II, they fell in love, an affair marked by adversity, exile, and, tragically, her death at the age of just 25. Her Partita for Piano and Strings is a masterpiece. So too, his earlier Partita from 1931. 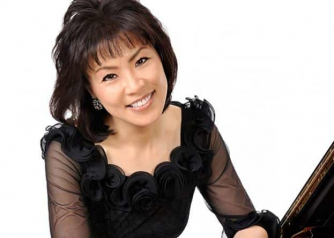 Noriko Ogawa, one of the leading pianists of our time, is the soloist in both the Kaprálová and Mozart’s own string orchestra version of his effervescent Piano Concerto in C Major K415. The LCMS’s second concert in the Venus Unwrapped series, with the ESO and Kenneth Woods, celebrates not only women in music, but also Czech music and the solo piano. Martinů’s exciting Partita for Strings from 1931 is followed by Mozart’s beautiful C major piano concerto, with the famous pianist Noriko Ogawa. Vítězslava Kaprálová is becoming something of a cult figure in early 20th-century music; born in Brno in 1915, her amazing and prodigious Partita for Piano & Strings dates from 1939, just before the end of her short life at the age of 25. The concert finishes with Dvořák’s ever-popular Serenade for Strings.